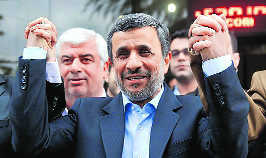 Iran’s former President Mahmoud Ahmadinejad today unexpectedly filed to run in the country’s May presidential election, contradicting a recommendation from the supreme leader to stay out of the race. Ahmadinejad’s decision will upend an election many believed would be won by moderate President Hassan Rouhani, who negotiated the nuclear deal with world powers. Though Rouhani has yet to formally register, many viewed him as a shoe-in following Supreme Leader Ayatollah Ali Khamenei’s recommendation in September for Ahmadinejad to stand down. But many hardliners in Iran seek a tough-talking candidate to rally around who can stand up to US President Donald Trump. Ahmadinejad’s candidacy also could expose the fissures inside Iranian politics that linger since his contested 2009 re-election, which brought massive unrest.